Refugees are our neighbors. When we think of refugees, we often hear of the Biblical call to 'welcome the stranger'. The Private Sponsorship of Refugees Program (PSRP) gives Canadians the unique opportunity to play a meaningful role in 'welcoming the stranger' through the integration of refugees to Canada. We encourage you and your church to consider this life-giving opportunity. The need is great. World Renew's Refugee Sponsorship and Resettlement Handbook is a fantastic comprehensice resource that acts as a hands-on guide to the entire refugee sponsorship process. 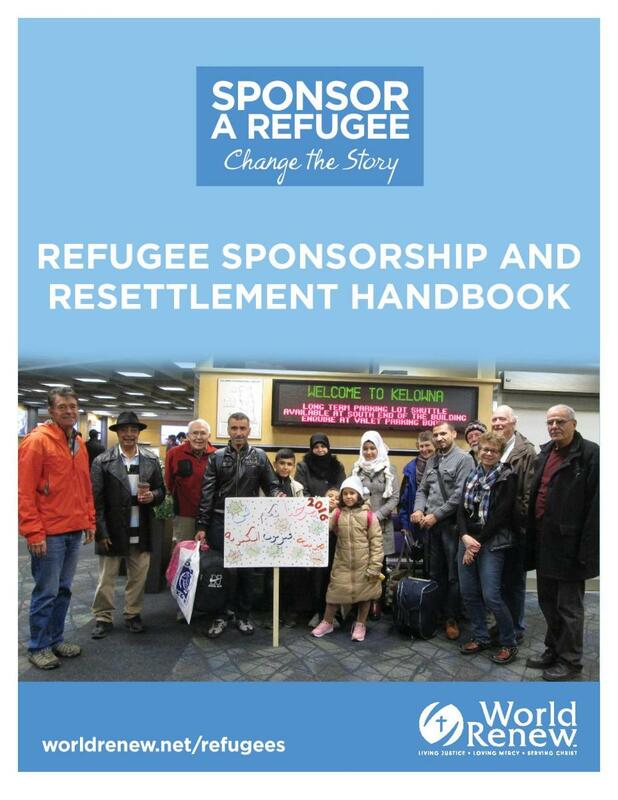 If you are interested in learning more about this process of sponsoring a refugee with World Renew, click the image below to download the handbook. Currently, there are four different streams through which refugees fleeing persecution can be sponsored to come to Canada. All sponsored refugees arrive in Canada as Permanent Residents. (GARs) are identified by the United Nations High Commissioner for Refugees (UNHCR) and resettled to and supported in Canada by the Government of Canada through the Resettlement Assistance Program (RAP). Under RAP, these refugees are supported at approximately the equivalent of social assistance levels for up to twelve months after their arrival in Canada. These are refugees who have been referred to Immigration, Refugees and Citizenship Canada (IRCC) for sponsorship by a Sponsorship Agreement Holder (SAH), such as World Renew. Sponsor-referred refugees are often refugees who come to the attention of a sponsoring group through a refugee’s family member who lives in Canada. The family member will bring their family’s refugee case to a sponsoring group for their consideration for sponsorship. For this reason these sponsorships are sometimes referred to as Family Linked Sponsorships. The sponsorship period is for 12 months, effective from the arrival date of the refugees in Canada. The refugee family must settle in the community of the sponsor and the sponsoring group. This program matches refugees identified for resettlement by the United Nations High Commissioner for Refugees (UNHCR) with private sponsors in Canada. It is referred to as “blended” because it is a cost-sharing arrangement between IRCC and private sponsors. The BVOR Program is particularly suitable for churches and groups that have not been approached by a family in Canada to sponsor their relative(s). Refugees resettled through the BVOR program receive income support from IRCC through the Resettlement Assistance Program (RAP) for six months after their arrival, specifically during months two through seven. Private sponsors pay the other 6 months of support—month 1 and months 8 through 12 —and all of the start-up costs. The church/group is also responsible for providing the hands-on settlement support throughout the sponsorship year. These sponsorships involve refugees that have special needs that will likely result in a longer or more difficult period of integration. Because of this, most refugees that come to Canada through the JAS program receive settlement support from their sponsoring group for 24 months after arrival. In exceptional circumstances, the government will request that the sponsoring group provide 36 months of settlement support. In this program, the government covers the full cost of sponsorship for the full duration of the sponsorship period while sponsoring groups are required to provide orientation, community, and emotional support as well as ensure access to appropriate services. It is recommended that only groups with previous refugee settlement experience undertake a JAS. ADDITIONALITY: Privately sponsored refugees are over and above the refugees resettled by the government (Government Assisted Refugees). Canadians want to know that their government is fulfilling its responsibility, on behalf of all Canadians, to protect refugees through resettlement, and that any refugees they sponsor are additional to those resettled by the government. NAMING: Sponsors can propose the individual refugees they wish to resettle. Naming means that Canadians can respond to the needs of individual refugees or particular refugee communities that concern them. You might also be familiar with the term refugee claimants. World Renew’s Refugee Program does not work directly with refugee claimants. These are individuals who request refugee protection upon or after arrival in Canada. A refugee claimant receives Canada’s protection when found to be a Convention refugee, or when found to be a person needing protection based on risk to life, risk of cruel and unusual treatment or punishment, or in danger of torture as defined in the Convention Against Torture. A refugee claimant whose claim is accepted can make an application in Canada for permanent residence. This application may include family members in Canada and abroad. The ideal solution for most refugees is repatriation--the resettling of refugees back to their country of origin. For those who cannot return home, a second solution is for the refugee to create a new life in their country of asylum. However, if neither of these solutions is possible, refugees may be resettled to a third country like Canada. Refugee resettlement is the third and final possible solution available to refugees. This often comes as a surprise to many North Americans, A mere 1% will be welcomed into a new country. Limited numbers of countries willing to resettle refugees and limited number of resettlement spaces per country are the main reasons so few refugees are resettled. Those that are, face difficulty in adjusting to a new culture and often find their education and work experience less valued in their new land. What Responsibilities Do Refugee Sponsors Have? The sponsoring group is responsible to provide the social, emotional, and financial support for the refugees upon their arrival to Canada and for the sponsorship period of one year. World Renew and the sponsoring group work closely together throughout the sponsorship process. World Renew provides guidance, expertise, and support to the sponsoring groups. Privately sponsored refugees arrive in Canada as Permanent Residents and must settle in the same community as their sponsor. If you are interested in learning more about sponsorship, please contact us! World Renew’s Refugee Program will be happy to provide you with resources, administrative support, and practical advice throughout the entire process from application, to airport welcome, to resettlement. Our Refugee Sponsorship and Resettlement Handbook contains a wealth of information about the process and how your church can get involved. World Renew’s Refugee Sponsorship and Resettlement Handbook is your comprehensive guide to completing a refugee sponsorship with World Renew. It provides details about the various steps in the refugee sponsorship process and its appendix contains 34 different standalone resources that you can download and share with your sponsorship committee and volunteers as needed. The following items are referenced but not included in the handbook due to their length. Please find below a variety of downloadable refugee sponsorship handouts. Citizens for Public Justice recently released a report entitled "Reclaiming Protection: Advocating for an end to Canada - U.S Safe Third Country Agreement"
This report details how the Canada-U.S. Safe Third Country Agreement has restricted access to refugee protection, put refugees in danger, and failed to uphold their rights to receive a fair hearing in Canada. We encourage you to read, reflect, and respond to this report.